Ok, maybe not as hot as it gets in, say, Uganda, but HOT. I was working in Hobart today, in air conditioning, so that was ok. It was the thought of coming home afterwards, to a house that’s been baking in the sun for a few hours, no air conditioning and no breeze that kind of worried me. Thing is, our house must be in the hottest pocket of the Derwent Valley. I thought it was hot in Fentonbury but I was always buoyed by the knowledge that Bushy Park was always hotter (or colder) by a few degrees. And they had fog. Almost every single day in winter. Then we moved to Magra. Where it gets cold. And foggy. And wet. On Wednesday they predicted something in the 30s (celsius of course). I doubt it got to that. In Hobart at least. It was warm, but not stifling. There was a cool breeze coming off the Derwent. I drove to New Norfolk and it was quite pleasant there too. Hot sun but a cool breeze. Windy almost. Not a skerrick of a breeze. Just stinking, stifling, sticky, sickening heat. I parked the car in the carport and the first thing I saw was my gorgeous wilting hydrangeas. They were melting into the ground! Now you know I don’t do well in the heat. If I didn’t love those plants I’d have said “Oh well, they’ll get watered tonight when I do the rest of the garden” and gone inside to sit in front of a fan and groan. But I do love them. They’re the first hydrangeas I’ve ever managed to keep alive a week beyond purchase! And they were doing so well in that spot… Its south facing so doesn’t get as much sun as the rest of the garden, I water them daily in summer, they seemed happy. Today was predicted to be the hottest day in Tasmania for the last 50 years or something. Tomorrow will be 20 degrees cooler, they say. Thank goodness for our changeable weather conditions! Meanwhile, I decided to go to the movies today. I wanted to see Saving Mr Banks cause 1. I love Tom Hanks ( if Tom ever called I’d dump Wayne in a flash), 2. who doesn’t love Mary Poppins, and 3. movie theatres are air conditioned! I almost missed the movie. Well, ok, not quite, but I’m glad I decided to get there an hour early to have a coffee and relax. Took me 30 minutes to get into the car park. There were two older women in small cars stuck in some kind of standoff, jammed so that neither could get in or out. Honestly. You know what they say about women drivers? Well, I had to agree today. I almost got out of my car and offered to drive the car out of the parking lot for the totally useless one. I managed to get my car in, and out, without any trouble. Trust me, four door 4×4 utes aren’t made for tight parking spots… Most people just don’t know how to drive. Anyway, loved the movie. Laughed lots and cried some. And guess what? It had cooled down and even rained a bit when I got out. Thank goodness for Tasmania’s changeable weather. It bears repeating. Hold it…HOLD IT! You LIKE Mary Poppins? YOU? Do you realize it's a musical? 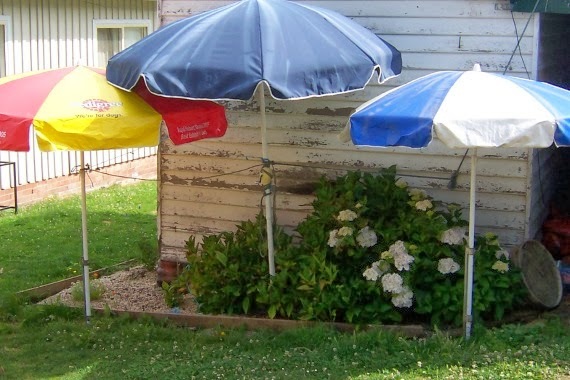 Glad you saved your hydrangeas and I like the umbrellas. Looks like a statement – you know, like ART! Anyone asks, that's exactly what it is. Garden art.